Banasur was the 10th descendant of Prahlad and eldest among 100 sons of King Bali. He was fond of Lord Shiva from childhood. Banasur meditated and worshiped hard to appease Lord Shiva when he was grown up. Shiva appeared before him and gave him the boon of thousand powerful arms and that he becomes very powerful. Banasur also asked for the boon that Shiva would always protect him whenever he is in trouble and Lord Shiva granted him that too. After he received the boon from Lord Shiva, Banasur began to be an egotist and arrogant. He then attacked Kailash, an abode of Lord Shiva. Seeing this Lord Shiva got angry and said that his demise was near. He also reminded him that the reason for his demise had already been born and he would notice this when the flag on his kingdom gate would be broken. Banasur had a daughter Usha who saw a handsome prince in her dream and fell in lust with him. One day she told one of her maids, Chitralekha about her dream. Chitralekha with her black magic draws a portrait of the prince seen in Usha’s dream. Usha confirmed that the portrait was the same person, which she saw in her dream. Chitralekha told that the prince was Anirudda. Usha asked her to bring him to her. Aniruddha was the grandson of Lord Krishna. Chitralekha through her magic reached Dwaraka and made Anirudda unconscious while he was in sleep. Then she took Anirudda in front of Usha. When Anirudda woke up Usha explained about her dream and how she fell in love with him. Anirudda looking at the beauty of Usha fell in love with her. They stay together in her compartment for several days. While Anirudda stayed with Usha, the flag on the gate of the kingdom broke and fell off. Noticing this Banasur became suspicious that there was somebody outsider in his palace. Banasur finds out that Anirudda was in Usha’s compartment and then he took Anirudda into the captive. Meanwhile, there was already huge havoc in Dwarka about the loss of Aniruddha. Krishna received the message that Banasur held Aniruddha captive. He then, along with Balarama and some army, attacked Banasur’s kingdom. Balarama with his power destroyed all of Banasura’s army. 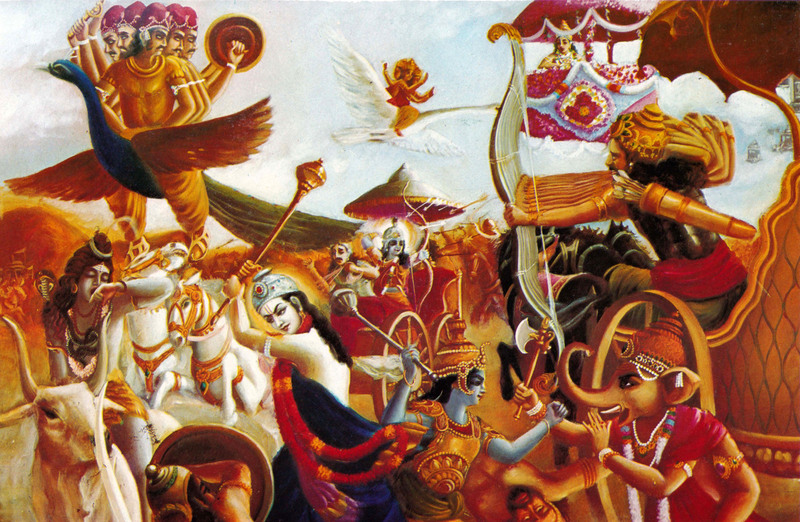 Banasur confronted Krishna but he was powerless in front of Lord Krishna. Then Banasur prays for Lord Shiva. Lord Shiva, confined with his boon, came to rescue Banasur and started the war with Krishna in order to protect Banasur. 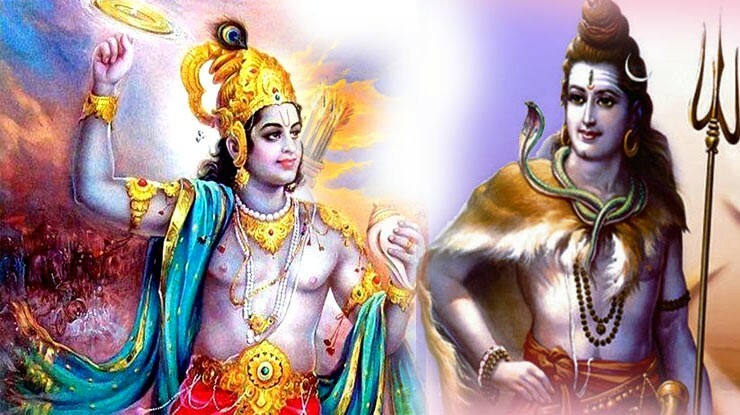 Both Lord Shiva and Lord Krishna battled with each other. When Krishna found out that he was helpless to kill Banasur when Lord Shiva is protecting him, he prayed to Lord Shiva silently. Then Lord Shiva gives him a trick to follow. Krishna threw an arrow that made Lord Shiva fall asleep. After this, Krishna took out his Sudarshan Chakra and cut off all the arms of Banasur. Finally, he ordered the Sudarshan Chakra to cut of Banasur’s head when Shiva woke up and blocked the Chakra. Shiva then pledges Krishna to forgive Banasur as he is one of his great devotees. Looking all these pictures, Banasur also felt ashamed and asked for forgiveness. He also promised to let down his arrogance and be good in future. Banasura then married Aniruddha and Usha to each other and left them with Krishna respectfully.